Jay M. Meyers Lt. Col. (Retired) Jay M. Meyers,83, of 2812 Park Road, Charlotte, died January 15, 1997, at Carolinas Medical Center after an illness of several weeks. He was born July 7, 1913 in Nashville, TN. The funeral will be at 2 p.m. Saturday, January 18, at St. Peter's Episcopal Church, 7th and Tryon Streets. Interment will follow at Forest Lawn West Cemetery. The family will receive friends from 7-9 p.m. Friday, January 17, at Harry and Bryant Co.
A World War II and Korean Army veteran of 26 years, he served in the 508 Parachute Infantry Regiment on occupation duty in Germany, with the 11th Airborne Division in Japan and participated in two combat parachute jumps with the 187 parachute Regiment in the Korean War. He graduated from the Army Command and General Staff College, received his Bachelor's degree from the University of Omaha and his Master's degree from the University of Pennsylvania. He was a member of the Charlotte Chapter of Retired Officers Association in which he had served as President and Director. He was a member also of the Charlotte Chapter of the Military Order of World Wars. In 1970, he came to Charlotte and joined the staff at Central Piedmont Community College where he served as Director of Resource Development and Special Projects until 1979, when he retired. he and his wife have maintained an active wellness business affiliated with Shaklee Corporation. He is also a member, past President and Lifetime Member of the American Society of Training Directors, a member of the Optimist Club, member and Past President of Phi Delta Kappa. He was known and loved for his sensitive compassion and thoughtfulness for all, and the graciousness with which he embraced everyone. He is survived by his loving wife, Dr. Muriel (Mimi) Vollum; and six children, Gayle (Mrs. Joe Ziegler) of Mishawaka, Indiana, Jay Fearon (Jason) Meyers of Charlotte, Micaela Marr (Mrs. David Marr) of Dumfries, Virginia, Eleana Boyer of Woodbridge, VA, Emilie (Mrs. David Knight of Charlotte, and Richard Meyers of Atlanta, Georgia. He will be missed also by fourteen grandchildren and five great-grandchildren. Harry and Bryant Co. is serving the family of Lt. Col. Retired Jay M. Meyers. 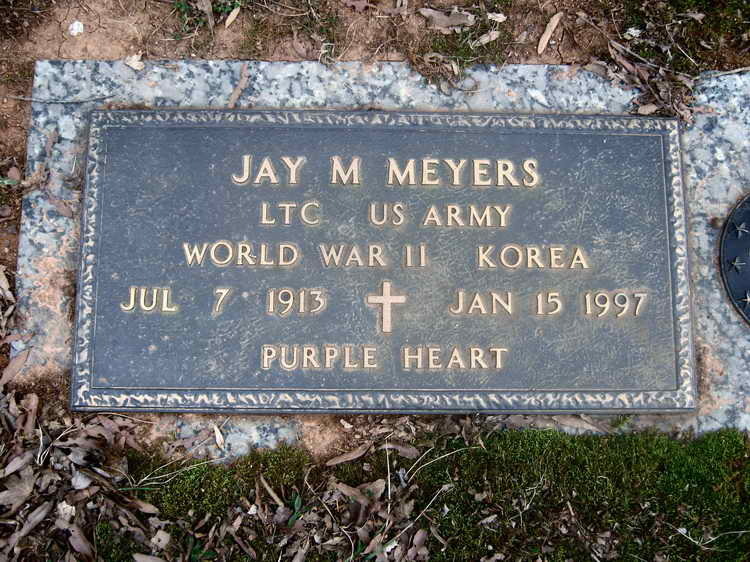 Grave marker for Jay M. Meters in Forest Lawn West Cemetery, Charlotte (Mecklenburg), NC. Jay joined the 508th sometime after May 1945 while the vestiges of the regiment was still performing occupation duty.